Get the Shadowhunters Pride Pullover Hoodie, this hoodie is perfect for any fans of the show. Great hoodie! Very soft inside and comfortable. The colors look really nice and it fits great. There is a vinegar scent when you first open it from the packaging I guess but if you wash it before you wear it it’s goes away. Shipping wasn’t terrible either. Great purchase! Would buy again. 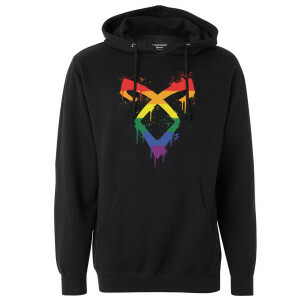 My pride hoodie is adorable however the XL is very different sizing than the XL zip hoodie I ordered. It was very long arms and is longer isn’t he body. I still love it but it’s different. Great quality and the image is perfect.